Only a skilled carpenter can fit a new door with an equal,neat margin. 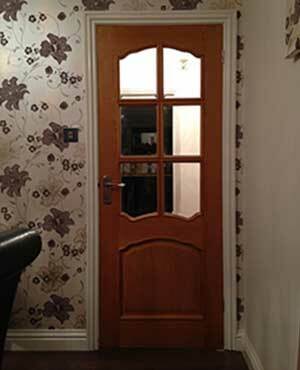 LA Carpentry can supply and fit your new doors that will not jam and will close properly. Fitting doors can be a tricky and skill full job that should only be carried out by skilled carpenters. All foundations of buildings move, this is a natural occurrence, when this happens door frames can also move making the edges uneven and bowed, this then makes the door frame wider in some parts and narrower in others but a new door comes with perfectly straight edges. We work on a price per fitted door, we can discuss your job and give you a free quotation on supply and fit of your doors. We can guarantee 100% satisfaction with our work and we can supply the doors, handles and ironmongery for your convenience.